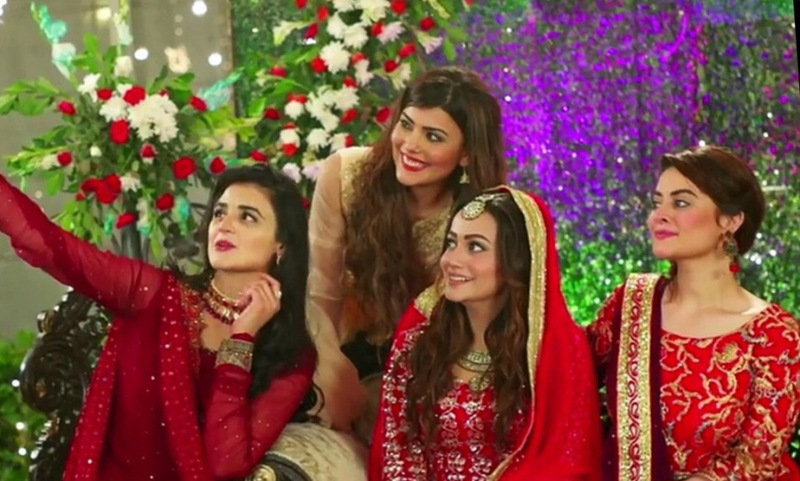 We keep saying that Pakistani dramas are producing either crying damsels or evil witches. And that criticism is wholly valid. I began watching Sun Yaara with similar beliefs, not really expecting anything different but a boo-hooing heroine and a scheming saas. And it did have many aforementioned aspects. However, it also pleasantly surprised in a lot of areas. Pleasant surprise number one: the divorced woman, Zarnish aka Lala Rukh, is no pariah. She isn’t a damsel in distress either. She is calm and rational. Once her moody, slightly nutty husband decides to send her the doomed papers, she reacts with stoicism and explains to her weeping family that their relationship was never strong to begin with. Lala Rukh is also someone who enjoys her life and the going-ons of her family celebrations with full zeal and fervor without moping. She is self-confident and does not portray the victim archetype at all. Very pleasant to watch a woman cope with a social anathema like divorce. Pleasant surprise number two: the funny, gentle comedy. Asim Mahmood, aka Khurram, delivers some of the enjoyable light-hearted quips that change the mood of the scene. His dialogs are well-written but his delivery and portrayal of the sensible yet humorous Khurram is much appreciable. In an overall scenario where every male role is either serious or gruff or moody, Khurram’s character is a breath of fresh air and you want him to be in more scenes so he can tell everyone to just chill out. All in all, because of these amusing dialogs and relatively light storylines, Sun Yaara is a fun watch – it has a Karan Joharesque feel: it’s fluffy, it has pretty faces, enjoyable dialog and it doesn’t weigh on your soul like you’ve just been drained of all happiness. What doesn’t work about Sun Yaara is the subplot that is seemingly anchoring the entire plot is about a woman pinning the claim of sexual harassment on a guy she wanted to marry. That was ridiculous on so many levels and irresponsible on many levels more considering that Pakistani society is still in the stage of evolution when it comes to accepting or discussing sexual abuse. In Sun Yaara, Tania (Ghanna Ali) wants to marry Talal (Junaid Khan) but he doesn’t really respond in kind. Tania later locks herself in a room with him and claims to everyone that he was trying to sexually harass her. This leads to Lala Rukh’s divorce (Tania is Lala’s sister in law) and a brand new plethora of problems. A few years later, we see that Tania is married to someone else but is continually remorseful of her actions. She encounters Lala Rukh and feels even worse because she cannot let go of what she did. Lala Rukh’s ex husband is also mopey and unhappy with his new wife – and Tania blames herself for this too. That is slightly pleasantly surprising too – showing someone dealing with the consequences of their revolting behavior. However, the root of the problem remains the same. The core plot dismisses sexual harassment and vilifies many women who would want to speak up about sexual abuse. They could have easily shown Lala Rukh as a divorcee due to Saifi (her husband) and his borderline personality. If not for this subplot, Sun Yaara could have been a very fun and entertaining watch. Supermom, feminist, psychologist. Mainly nutty, partially sane. Mostly trying to keep it that way. Can Pakistan digest Sarfraz’s aggression?